March 14, 2018 by Jonathan R.
Dell’s XPS laptop series has always been about premium build quality and performance. The ultra-portable XPS 13 (Review) has long been one of the best premium Ultrabooks you can get for your money. However, the company hasn’t always been prompt in launching each new refresh in India. Take for example the 2017 Dell XPS 15, which debuted at CES in January that year but only made it to our shores last October – and let’s not forget the XPS 13 2-in-1, which didn’t arrive at all. 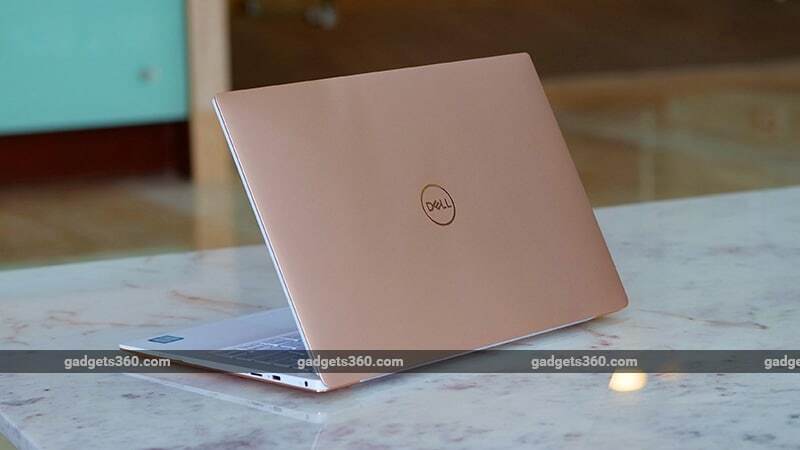 This year, Dell seems to be more proactive with its India go-to-market strategy, and barely a month after the company announced the 2018 edition of the XPS 13, it’s already available here for purchase. Today, we’ll be testing the top-end variant of the new XPS 13 9370 series, which boasts of a slimmer body, 4K UHD InfinityEdge touchscreen, and upgraded specs. Let’s see what it’s like. The new laptop is deceptively small, and even the box it ships in feels like it’s too small for a laptop to fit inside. 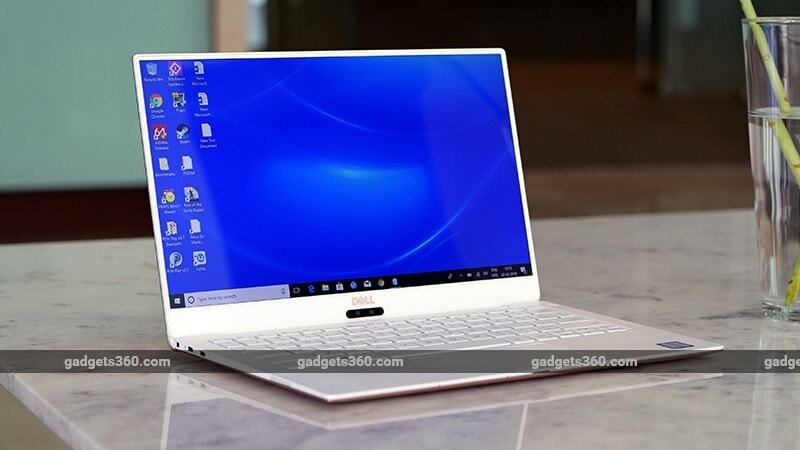 Taking a closer look at its actual dimensions, the new XPS 13 9370 is only marginally reduced in width and depth compared to the previous-gen XPS 13 9360, but Dell has shaved the thickness quite a bit, so it measures 11.6mm at its thickest point and just 7.8mm at the thinnest. We also found it to be very light, and it won’t weigh your bag or backpack down when travelling. Despite the size and weight, this laptop doesn’t skimp on premium materials. The chassis is built from machined aluminium, and has a soft matte texture so it’s relatively easy to keep clean even if you don’t use a sleeve. We have the white and rose gold version, which according to Dell, is the only colour trim this particular spec will be available in for now. We’re used to seeing XPS laptops in silver with a carbon fibre finish, but for this new colour combination, Dell has used a special woven glass fibre mterial on the palmrest area instead. It feels quite similar to the carbon fibre finish, and according to the company, it also has a stain-resistant UV coating to prevent it from yellowing over time. The keyboard is pretty comfortable. The chiclet keys are evenly backlit with white LEDs and have a good 1.3mm of travel, which makes them comfortable to type on. The arrow keys do feel a bit cramped but that’s something you might get used to with time. The trackpad is wide and offers smooth scrolling and gestures in Windows 10. The power button is placed in the upper right corner and has an integrated fingerprint sensor. Dell has also placed infrared sensors beside the webcam for face recognition. Both these methods can be used for logging into Windows 10 instead of typing in a password. There’s an array of four microphones facing forwards, along with a power LED. Due to the reduced thickness of the laptop, Dell has removed standard-sized Type-A USB ports, which is a shame. Instead of this, you get three USB Type-C ports and a single Type-C to Type-A adapter in the box. 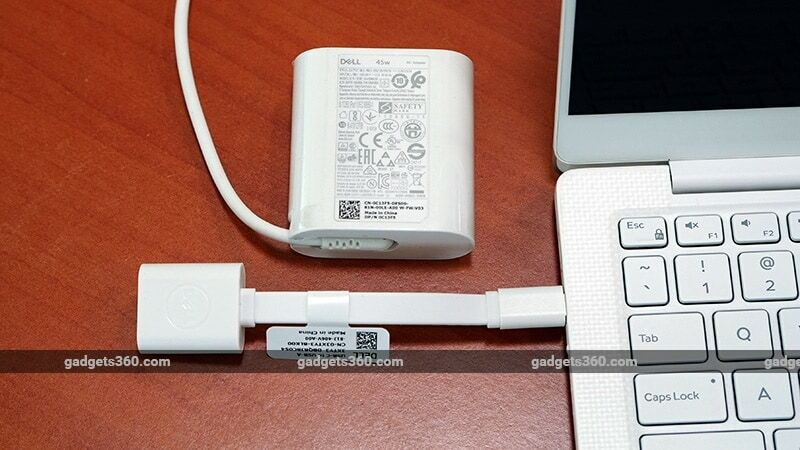 The two Type-C ports on the left are actually Thunderbolt 3 ports, while the one on the right has a USB 3.1 Gen. 2 controller. You can charge the laptop through any of these ports and even plug in an external monitor using an adaptor. You get a 1W speaker on each side of the laptop; a Noble lock slot for securing it; a microSD card slot; and a headphone/ microphone combo socket. We definitely missed having a full-sized SD card reader. The star of the show is undoubtedly the 13.3-inch InfinityEdge display, which now sports thinner 4mm borders on three sides. There’s still a thick chin below the screen for the Dell logo and camera. The display puts out 400nits of brightness, which we found comfortable under most lighting conditions. It does have a glossy finish but reflections aren’t much of an issue thanks to the high brightness. The 4K UHD panel that we have is also a touchscreen but since this isn’t a 2-in-1, we barely ever wound up using it. The aluminium lid offers very good protection and the screen doesn’t warp even when you apply pressure from the outside. The hinge offers good torsion and stays in place at any angle. At the time of writing this review, this particular variant isn’t available on Dell’s online store but we’re told that it will be added soon. The specifications include an Intel Core i7-8550U CPU, 16GB of DDR3 RAM, and a 512GB NVMe SSD. There’s no dedicated graphics processor here so you’ll have to make do with the onboard UHD Graphics 620 from Intel. The individual RAM modules aren’t identified by diagnostic software, which shows that they are soldered onto the motherboard and are therefore not upgradeable. Other specifications include dual-band Wi-Fi ac with 2×2 MIMO antennas and Bluetooth by Killer Networks; an HD webcam; and a non-removable 52WHr battery. The laptop ships with Windows 10 Home 64-bit along with a full copy Microsoft Office Home and Student 2016, and a 12 month subscription to McAfee LiveSafe. Dell also installs its own software including Power Manager, which lets you monitor your battery’s health and set up profiles. There’s a new app for 2018 models called Dell Mobile Connect, which lets you receive calls and texts from your Android or iOS device through Bluetooth, directly on your laptop. It even lets you make calls or reply to messages from within the app itself. It works well, though you can only connect one phone to the app at a time. With an Android phone, you can also mirror its screen on the laptop. We found the new XPS 13 comfortable to use on our lap, and with light tasks, the exhaust fans weren’t audible. There are vents on the bottom and behind the hinge for air circulation. In order to tame the heat from the components, Dell has used a Gore Insulation Solution, which makes it the first laptop to use this material. Gore (or Gore-Tex), a flexible material that’s typically used in winter jackets, is intended to prevent the outer body from getting too warm to touch while dual fans and heatpipes push hot air out. In practice, this works well if you’re not doing anything too CPU-intensive. However, fire up a game and the fans ramp up quickly, making them very audible. The metal bottom of the laptop gets hot after a while, and we found that the upper left of the keyboard also got slightly warm, though the palm rest stayed cool. The XPS 13 can manage some 3D games, but at low visual settings and resolutions. The onboard Intel GPU is simply not equipped to handle heavy gaming. For instance, in Doom, we managed to get a playable framerate of 29fps but only at 1366×768 resolution using the Low graphics preset. The game doesn’t look very good, and there’s obviously a lot of visible aliasing, but it’s playable. However, the CPU is a good performer as we saw in benchmarks such as PCMark 8, which gave us scores of 3,319, 4,674 and 2,931 points in the Home, Creative, and Work test suites respectively. The SSD delivered a good overall score of 2.3GB/s in SiSoft Sandra’s Physical Disk benchmark, and its speed shows in general usage too. The laptop boots quickly and apps load swiftly as well. 512GB is a decently large amount of storage for an Ultrabook. The HD webcam has a good field of view but the video footage is slightly noisy when it is used under artificial lighting. There’s also no getting around the slightly odd perspective it offers due to its placement below the screen. Face recognition is quick although at times, when we had the XPS 13 on our lap, we had to either tilt it backwards or lift it a bit in order for the camera to see our face. The 4K resolution at this screen size gives you a dense pixel count of around 331ppi, which makes everything look really crisp. Viewing angles are very good and there’s good colour saturation as well. This panel also happens to support HDR, which makes the XPS 13 one of the few such laptops currently available. As long as you have it plugged in to a power source, compatible apps like Netflixautomatically detect the screen as HDR-capable. The brightness has to be bumped up all the way to 100 percent for it to be effective. The result is nice, especially in shows like Stranger Things and Narcos, which both looked really good. 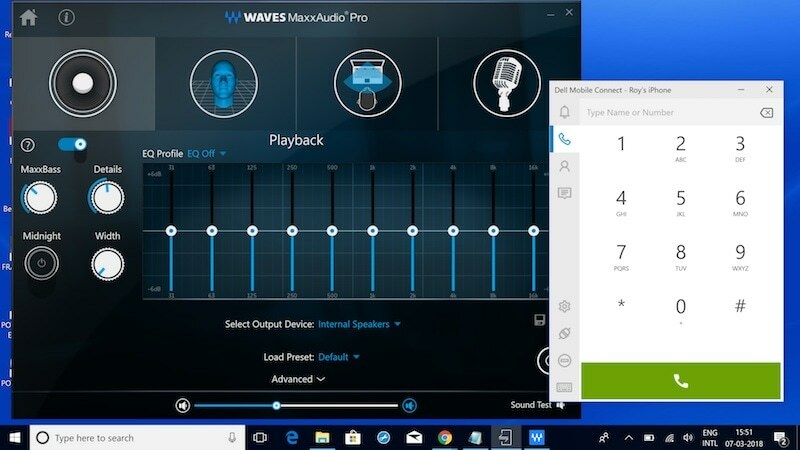 The stereo speakers do a good job with audio as well, and the Waves MaxxAudio Pro software lets you tweak how sound is delivered. We noticed an audio skipping issue when streaming to Bluetooth headphones (Apple AirPods as well as the Sony WH-1000XM2), and hopefully this can be fixed with a future software update. 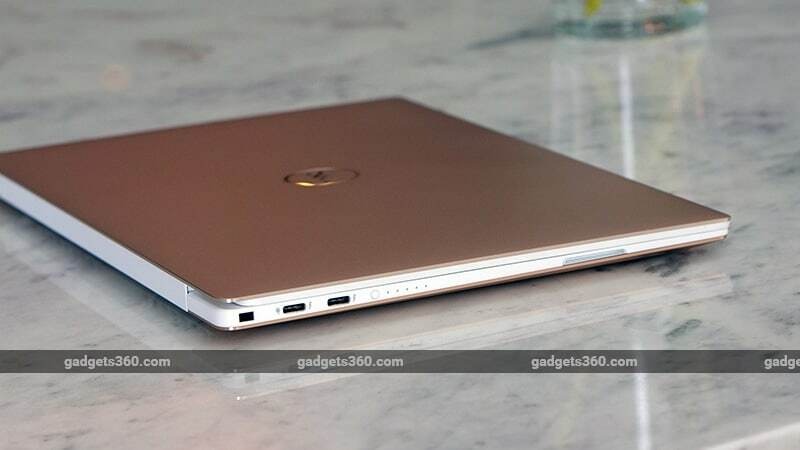 We were quite happy with the battery life of the new Dell XPS 13. Because of its 4K panel, we managed to squeeze out roughly 6-7 hours of ordinary use, which mostly involved working on Word documents and lots of Internet browsing. The laptop fared well in our intense Battery Eater Pro test too, which lasted for 2 hours and 23 minutes. The XPS 13 9370 is a good iterative update of Dell’s flagship ultraportable, with the top-end variant sporting an eye-catching 4K display with HDR support. However, this comes at a high price of Rs. 1,59,790, which is about Rs. 10,000 more than Lenovo’s Yoga 920 Vibes Edition which shares the same core specifications and 4K display, though minus HDR. Dell says that it will continue selling the existing XPS 13 9360 range, and most variants were updated with 8th Gen Intel Core CPUs late last year, so you have quite a few configurations to choose from. With the new XPS 13 9370 series, you get a slightly more compact design and slimmer borders for the display, plus the same speedy performance and premium build quality. If we could change some things, we would have preferred a full-sized SD card slot, which would definitely be useful, and perhaps a few more Type-C adapters included in the box.